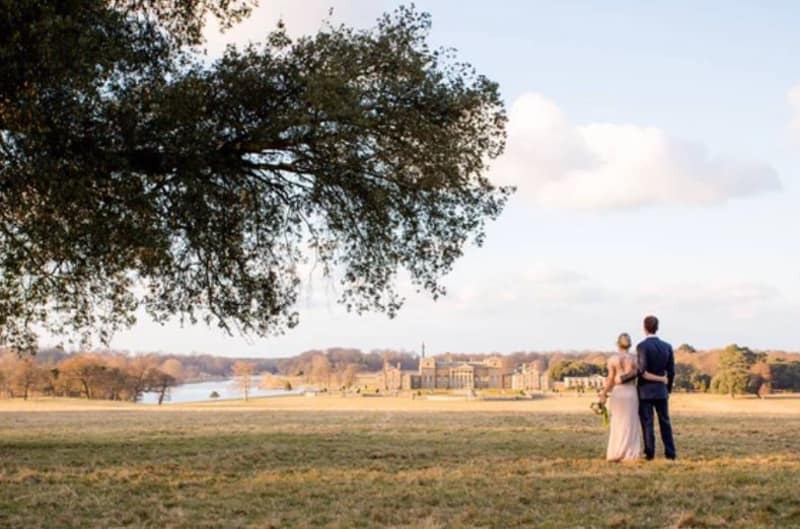 Standing tall within a vast deer park fringed by woodland and next to a romantic glassy lake lies Holkham Hall – the perfect place for you and your partner to say “I do” in true regal fashion. 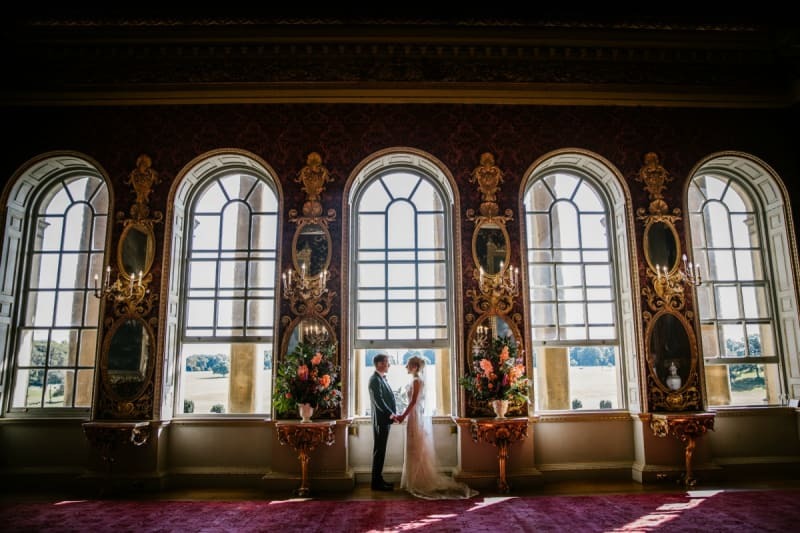 We can guarantee you won’t find another wedding venue quite like Holkham Hall. This exquisite 18th century Palladian house is set in 25,000 acres of parkland and is steeped in history. In fact, Holkham Hall is classified as being in the top ten most magnificent palaces, houses and castles in England today. And this one-of-a-kind wedding venue could be all yours for your wedding day. You approach the magnificent Holkham Hall in a traditional horse and carriage and it’s every bit as spectacular as you remember it. Inside, you know your wedding is waiting to take place. What will you notice first; your guests all turning to face you; your partner standing at the end of the altar before a cascading staircase beautifully illuminated with natural light from the huge arch windows, or will you simply be awed by the abundance of magnificent architecture? You step into The Marble Hall and are instantly blown away by the enormous, fifty feet high vaulted ceiling, inspired by none other than the Pantheon in Rome. Marble pillars frame this incredible hall; only adding to its grandeur and opulence. Your partner and your guests share in your splendour and are noticeably enamoured by the incredible place you’re graced to be in. 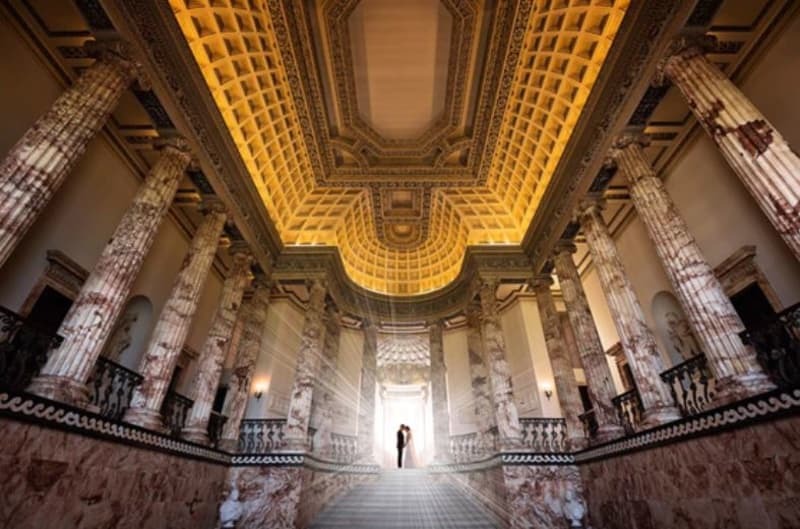 Probably one of the grandest entrance halls in Europe, the Marble Hall delivers a sensory explosion that is bound to leave a lasting impression on both of you and your guests. Despite the enormity of its beauty and its ability to seat large wedding parties (142 people on the ground floor and 170 people if the side balconies are used) The Marble Hall somehow feels intimate and incredibly private. You reach your partner and smile; it’s time to speak your vows. Once you’ve sealed your future together with a kiss, it’s time to allow guests the opportunity to say all the things they’ve wanted to say about the venue they’re in. You decide to hold your wedding reception in The Marble Hall too because this is a space you don’t want to rush out of. The experienced wedding coordination team have set up trestle tables and ensured champagne is poured and the canapes plated up in time for the reception, so that guests can rise from their seats, collect refreshments and mingle – all without you and your partner even noticing the transition. 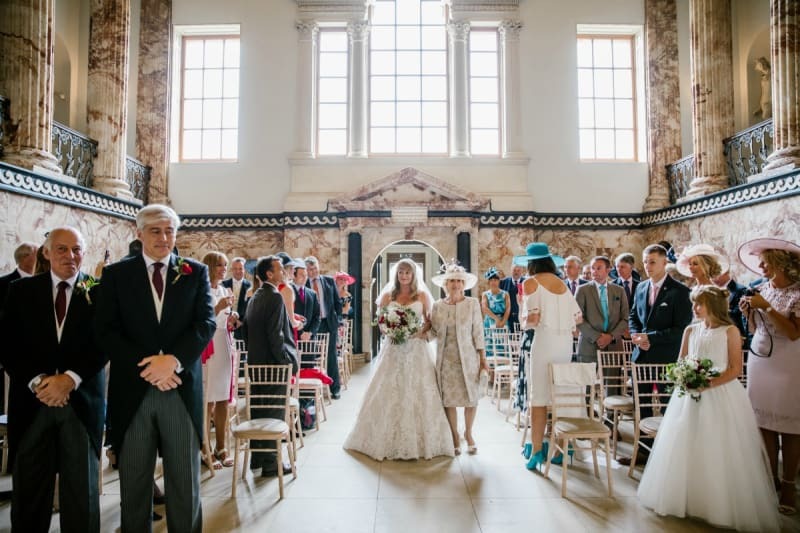 After a period of congratulations and chatter about how magnificent Holkham Hall really is, you gather your guests and urge them to move on to the next show-stopping part of your day – promising them it will be worth it. Your guests are led to the wedding breakfast which is held in the walled garden; a mid-eighteenth century garden boasting a manicured lawn and colourful plant borders – within which you have a glorious marquee designed completely to your taste. Just so you know…the experienced team of wedding planners at Holkham will recommend the best suppliers to ensure you can find and secure stunning marquees, delicious food, perfect flowers and talented photographers. You design your day exactly as you wish. Guests step into the beautiful marquee which is twinkling with fairy lights and chandeliers and take a seat in preparation for the bespoke feast you’ve created for them; awaiting the speeches that are bound to make you all laugh and cry. Just so you know…The Holkham wedding planning team works with several experienced and professional caterers who have been carefully selected for the quality of their food, competitive pricing and friendly and helpful service. You can work with them to build a menu that suits you and your ideas for your big day. When everyone is suitably full (and probably a little merry) you’ll catch up with friends and family as the wedding breakfast is cleared away; making way for the big wedding party. Night falls and guests begin to find their way to the bar and dancefloor as the DJ or band bring the party to life. Weddings at Holkham Hall are truly like no other and it’s wonderful to know you’ve stamped your own little piece of history on the place. Tons of great spaces available for exclusive hire to ensure you have the perfect setting for your wedding. A historical gem set in beautiful grounds – ideal for photographs. The support of an experienced team of wedding planners who will recommend the best suppliers to ensure you can find and secure stunning marquees, delicious food, perfect flowers and talented photographers. Ability to design your day exactly as you wish. Licensed for civil weddings and partnerships with the added option of getting married at the local church. Wedding package prices start at £9,975 for out of season weddings based on 80 adult day guests. The Saloon can accommodate up to 80 seated guests for a wedding ceremony. The North State Dining Room – a classical space for a wedding ceremony with up to 50 guests. The Statue Gallery – contains the most complete collection of classical statuary and can seat up to 100 people. The Temple – tucked away in the woods and offering indoor ceremonies for up to25 guests or outside under the portico for larger numbers. The Lady Elizabeth Wing – an exclusive and contemporary reception space catering for up to 250 dinner guests and 360 evening guests. The Park – utilise some of the vast parkland with views of Holkham Hall; great for very large weddings.